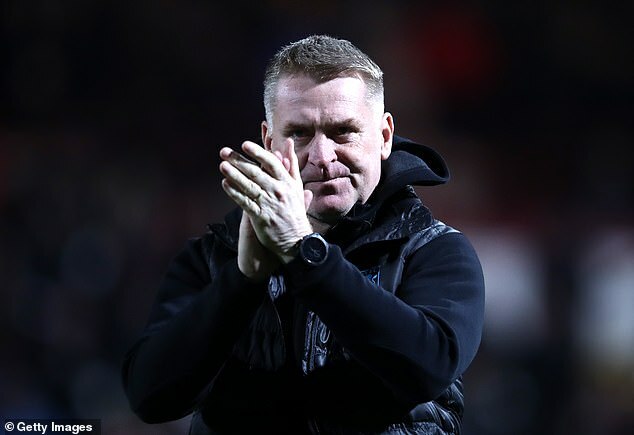 Neal Maupay struck his 21st goal of the season to ensure Dean Smith’s return to Griffin Park was an unhappy one. We’d just entered four minutes of stoppage time when the prolific French striker, whose scoring touch had deserted him all evening, took in a Sergi Canos pass and showed tricky feet as Tommy Elphick went to ground far too easily. 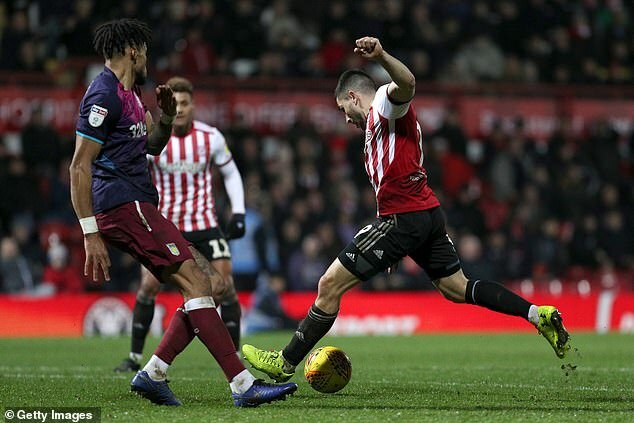 Maupay then jinked past Tyrone Mings and dispatched his shot high into the net. It was all the Bees deserved for a stylish performance that stifled Smith’s Villa and it must have been hard for the manager who departed here back in October to see the team he helped craft over three years emerge victorious. ‘Deano, Deano what’s the score,’ sung the home fans as Smith’s successor and former assistant Thomas Frank got the better of his former boss. ‘Everyone who is into football, that feeling, that is why we’re in this world to experience those moments,’ Frank said of the winner. Smith was left ruing missed opportunities on the counter-attack: ‘Chances fell to us tonight and we missed them, it was a frustrating and disappointing night,’ he said. Griffin Park afforded Smith a warm reception as he made the familiar walk across the pitch to the dug-outs just before kick-off, but once the first whistle sounded, there was little room for sentimentality. Smith had spoken of needing to ‘tactically out-think’ his opposite number Thomas Frank, his trusted assistant here for almost two years. 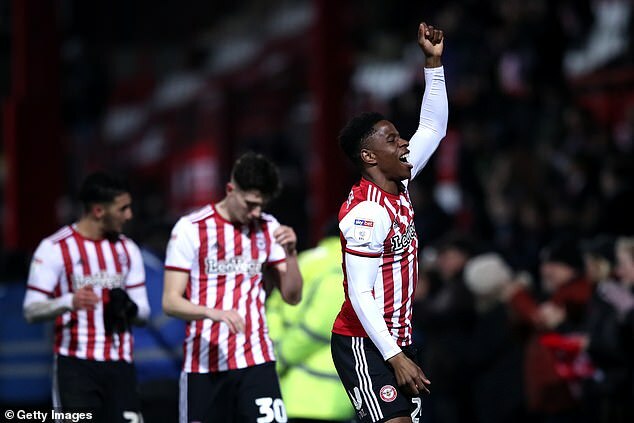 But on the evidence of the first-half it was clear that Frank has already further polished and refined the approach that served Brentford so well in three seasons of top 10 Championship finishes under Smith. While 3-4-3 may have passed out of vogue just down the road at Stamford Bridge, it is a system that allows Brentford to stretch every inch of space out of Griffin Park’s tight confines. 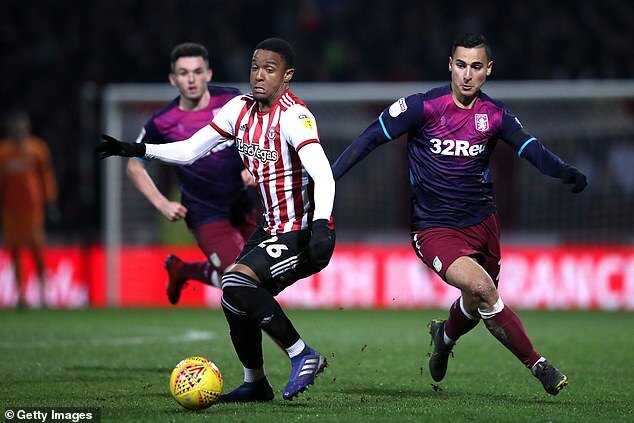 Sergi Canos at right wing-back carried a constant first-half threat, after Frank showed him videos of Chelsea’s Pedro playing the same role, while Moses Odubajo on the left wasn’t someone 34-year-old Alan Hutton wanted to see running towards him. The set-up suits their speedy and willing wingers, their energetic pressing game and the chemistry between the forward line that was evident in their early dominance. 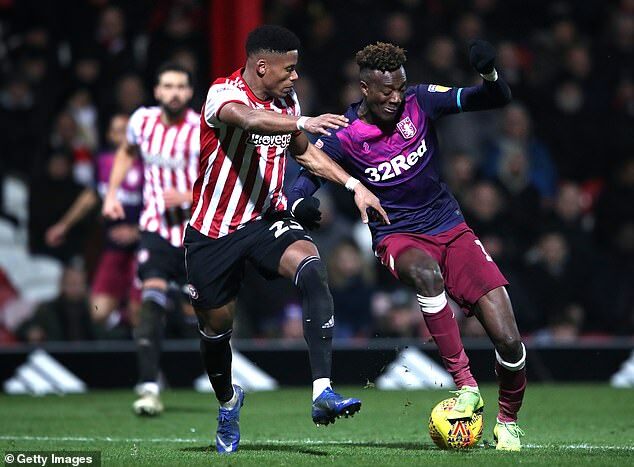 Brentford’s recent upturn in results, 10 matches in league and cup broken only by defeat at Nottingham Forest last Saturday, supplied confidence as well and they dominated Villa before the break. On four minutes, Canos controlled smartly on the edge of the Villa box and his dipping strike had to be touched over by Lovre Kalinic, before Tyrone Mings was required to make a last-ditch, sliding intervention to prevent Maupay getting through. Odubajo drove Hutton back inside his own penalty box with a purposeful run, eventually working an angle to shoot into the side-netting. But the best opening came when Canos yet again penetrated the Villa back line, his deflected cross falling to Said Benrahma just inside the area. The Algerian turned sharply but fired marginally wide. Villa had been hustled throughout, surviving off scraps of possession, ruthlessly penned in… yet they had occasional moments on the counter. It took 27 minutes for the visitors, who started the night seven points off the play-offs, to muster a chance of note, with Anwar El Ghazi forcing Daniel Bentley into a good parry. And the one time Odubajo was caught out of position, Albert Adomah was unable to punish him, rolling a shot agonisingly wide of the far post having muscled his way into a shooting position. 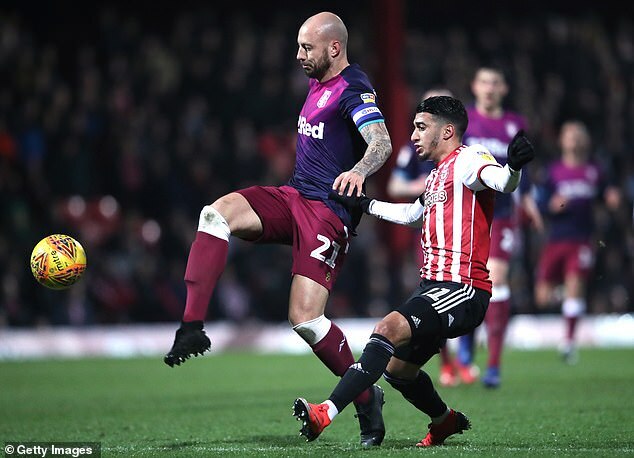 There was no drop off in Brentford’s intensity at the start of the second-half, with Canos seizing onto the ball ahead of El Ghazi and playing Maupay into a great shooting position. For once, the 20-goal striker fluffed his lines and skewed wide. 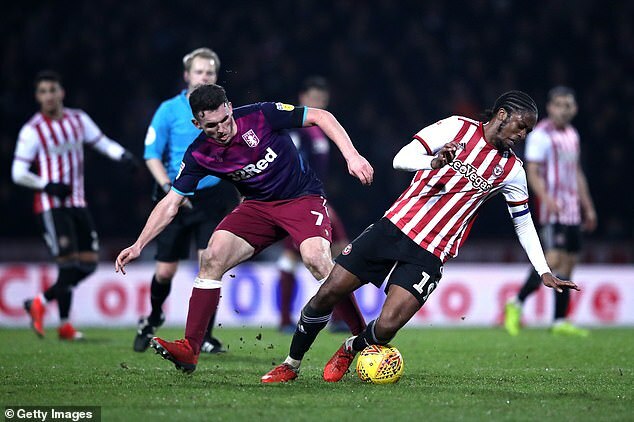 Villa looked rattled and Kalinic had to repel a thunderous Ollie Watkins effort before penalty appeals were waved away when Romaine Sawyers was brought down by El Ghazi. Once they’d recovered their poise, Villa once again showed prowess on the break, with Conor Hourihane played into the clear by Andre Green only to be denied by Bentley, who’d made himself as large as possible. In the dying minutes, Tammy Abraham, barely involved all night, headed straight at Bentley, before his rival for the Championship golden boot Maupay snatched at a chance after neat build-up play. However, Maupay would not be denied.